How amazing does she look on this 'Amazing Spider-Man' tour? Okay, I know not all y&apos;all share my girl crush on Emma Stone. I&apos;ve heard more than a few people say they are bothered by her mouth. And her voice. I really am coming around on the blonde hair. Especially in this style—how come when I had side-bangs, my hair would never sit perfectly sleek like this? Also loving the smoky eye with the bare lip. And she&apos;s doing a Coco Rocha thing with her tongue! Can you believe this is Emma? It&apos;s a total departure from her usual look, and I APPROVE. For us civilians, the combo of the hair plus the lip plus the eyeshadow is probably too much (unless you&apos;re going to a black tie or something like that), but I think you could take two out of the three and pull this off in real life no problem. PS: Are you seeing how that dark lip that was big at the Met Ball is really going to be a thing? Yep. So here&apos;s something that looks extremely put-together and polished, yet isn&apos;t at all that hard to DIY at home. When my hair was shorter I used to do this all the time; mainly because I&apos;m not that handy with a curling iron! You just blow-dry as normal, and then take your curler and wrap the ends under. (You could get the same effect with a small-ish round brush too, but I find the curling iron easier.) Notice too the slightly brownish lip—another emerging trend. A coral lip is really my favourite kind of lip. And with this hair (I think it&apos;s a side bun), the effect is sorta 1940s. Look closely though, and you&apos;ll see a 2012 twist on the eyes: shimmery green liner. Oh I love you, Emma. Here&apos;s one for when you just want to look cute. Don&apos;t be shy with the liquid liner and really flick it out at the ends for a super-&apos;60s effect. Pair with this voluminous, teased pony placed high at the crown. Well, this is certainly A Lot Of Eyeshadow. It&apos;s very runway—for real life I would either tone down the colour and go more sheer, or only apply it up to the crease. (Although like I&apos;ve been saying for over a year now, the eyeshadow-up-to-the-brows thing is where it&apos;s at these days.) With her hair off the face, it definitely adds a focal point to the face. Check out the sides of her hair, BTW... it&apos;s got a super-cute twisty-roll action that pulls into the bun at the back. Okay, I&apos;m not too enamoured with this choice of eyeshadow, but you know what? It kind of works with that lip because it&apos;s all in the same harmonious colour family. And on the subject of hair, I have no idea what was done here, but I&apos;m guessing you could get that texture with a few spritzes of texturizing spray and some dry shampoo. Easy breezy when you&apos;ve gotta do something but have no time. Here we go with that eyeshadow again. Let&apos;s just ignore. Moving on—do you ever wear hair accessories? Like, aside from elastic bands I mean. I don&apos;t, and this pic makes me wonder why not. How much fun is this gold headband thingie? She looks about 12 here, and it&apos;s a nice palette cleanse from all the other heavily made-up looks, yes? Same hair as in London, but with a much more low-key face. That lip colour is to die for. Excuse the bad photo quality, but I had to show you this... there HAD to be a fuchsia lip in here somewhere! It definitely takes this hairdo out of prom land and into something much more sophisticated (yet still playful). You don&apos;t have to hide your bobby pins, you know. These ones—in white—are made to be seen, and I love that whoever did her hair made a statement by stacking three across and then adding the fourth on the diagonal. With the sweet dress and pinky lip, it makes for a very retro, feminine look. As someone who feels perpetually NOT put-together, this photo mesmerizes me. I too would like to have hair so perfectly waved, lips so precisely painted, eyes so expertly shadowed. The only nit-pick? 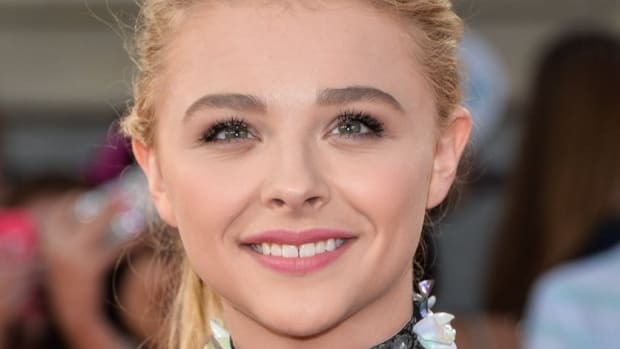 Perhaps the brows were overly plucked. But otherwise, this is beauty perfection, n&apos;est-ce pas? 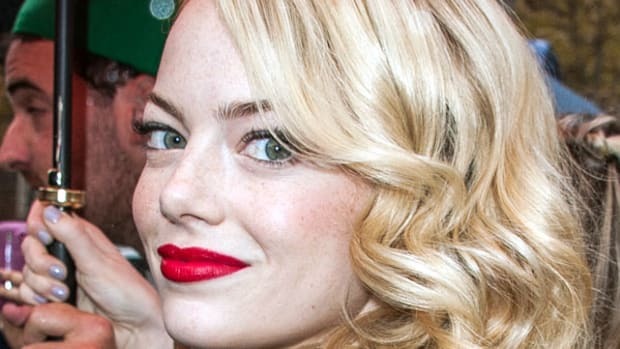 Are you an Emma Stone fan or do you wish I&apos;d shut up about her? Which one of these Spider-Man looks do you love? Anything here that inspires you for your own real-life beauty routine? Conjure up a costume with these 10 looks.